World Map Necklace. A wonderful earth day gift for a graduation gift or world traveler. Makes a wonderful present for a foreign exchange student. 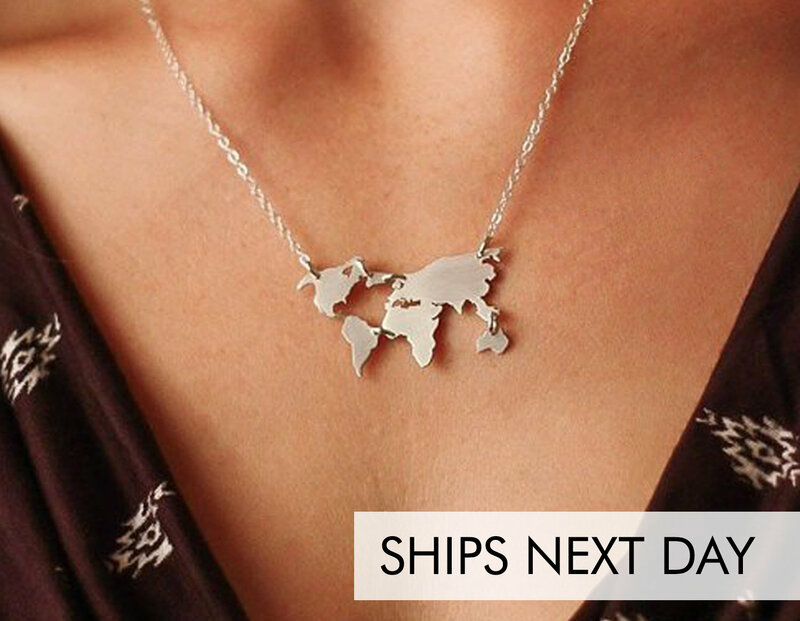 Jewelry world outline wanderlust gift available in sterling silver and 14K gold filled. Delivery estimates and various shipping options are available at checkout. • What Metal Do You Use? We use precious metals in our shop. All of our pendants, components, and chains are 935 Sterling Silver, 14K Gold Filled, or 14K Rose Gold Filled. • Will My Items Tarnish? Some care instructions... Take jewelry off when you sleep, shower, and cook. Keep perfumes, lotions, and chemicals off your items. Clean your jewelry with a polishing cloth or product like Tarn-ex. • How Thick Are Your Items? Our pendants are cut from 22 gauge metal. • What Size Are Your Pendants? Classic (1 inch/25.4 mm), Small (3/4 inch/19.05 mm), or Dainty (1/2 inch/12.7 mm). We size at the widest point of the cutout so a tall, skinny piece may appear smaller than a circular shape. Small is our most popular size! • Can I Order a Custom Design? Yes, absolutely! Send us a message and we can get started on your design. ©2009 - 2019 IvyByDesign, Inc. - All designs, photos, and descriptions are copyright of IvyByDesign, Inc. and photos may not be used without prior written permission. Great item! These were Christmas gifts for my world traveler friends and they loved them! Thank you! Is it gold or an accessory. Beautiful! I bought this for my world traveling friend who just loved it!